We are open from the 18th of April 2019 to the 3rd November 2019 every day. The Tuffalm is located near the Völser Weiher at the foot of the Schlern mountain. Due to its idyllic location, culinary treats of the South Tyrolean cuisine and its surpassing hospitality, the rustic lodge is a popular destination for those who enjoy active and relaxed holidays. This is the ideal place to forget about time and worries. 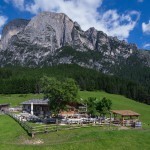 Immerse yourself in the marvellous nature and enjoy the view over the wide and lush alpine meadow. Therefore, in 2007, the readers of the most popular local newspaper voted our Tuffalm the most beautiful mountain hut in South Tyrol. Summer | From the 18. April to the 3.November is open every day. Of course, you can also stop by in the cosy hut to take a short break before you head out to more fantastic hiking tours in the National Park Schlern. In the near surroundings you can discover many lodges, hiking trails and magical places – set off on a search for ancient stories, tradition and mysterious myths and legends hiding in the Schlern region.